It is 1666 and the Plague has travelled north from London on a bolt of fabric to the small village where lives young Anna Frith. Widowed when her husband was killed in a mine, Anna is left with two young sons. As the plague ravages her village, she continues to help where she can as those she cares about are taken from her, one by one. It's been about a year since I read Caleb's Crossing and became determined to read more by Geraldine Brooks. Again, I was drawn in by her descriptions of life in the time period about which she writes and again I was reminded Ann Patchett. Brooks uses vivid imagery, and I kept rereading sentences because they were so nicely crafted. When evoking a feeling of fall, the images she picked seemed the most perfect ones she could have chosen: "wood stacked by the door, the tang of its sap still speaking of forest" and "the rumble of the apples tumbling into the cellar bins." That is in the very first paragraph, hooking me the moment I began reading. Like Patchett, her writing just seems so perfect. Of course, most of what she's evoking here is unpleasant - it's the plague, after all. Anna Frith has only small moments of happiness in a difficult life, made all the worse by the descent of a horrible illness upon her village. Still, those trying times brought out the best in some people, like Anna, who labored at the bedsides of those who needed it without fear for their own health. In others it bought out the worst - years before the Salem witch trials, villagers Anys and Mem Gowdie were accused of being witches because of their skill with herbs, and suffered greatly for it. The only part of the book I disliked was the epilogue. I'm starting to dislike most epilogues, I find. They are so out of control, jumping forward or shifting to some far-off place, disorienting the poor reader who has come so far and only wants an ending. This one felt less like a conclusion to this story than a small bit of another whole, entirely different, story. It was intriguing, but I would have preferred it be expanded on and presented as a sequel, not part of this book. 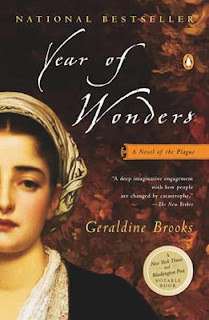 Otherwise, Year of Wonders was just as good as I had hoped. Anna Frith served as a worthy protagonist, smart and strong, and I liked reading about her life and her relationships with the other villagers, many of whom were intriguing and complex characters. Brooks brilliantly captured this small bit of history, bringing one small village and its inhabitants to life.